Creamy cheesy polenta is a perfect side dish for any saucy meat or ragu. Polenta can often turn out like cornmeal mush, but this recipe is quite the opposite. This will enhance your main course with the combination of cheese, richness from mascarpone, and garlic spinach. You know how you can get those stretchy strands of cheese when a dish is full of melted cheese? 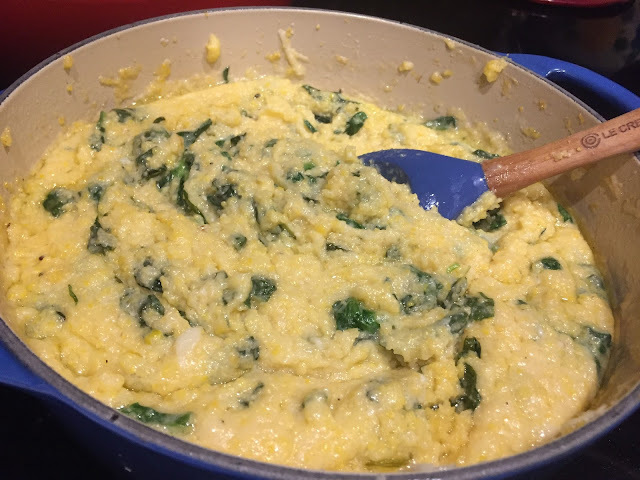 Yeah, this polenta does that with the combination of parm and pecorino romano. Winner winner! In a Dutch oven or large saucepan, bring the broth, water, extra virgin olive oil, and garlic to a boil over medium high heat. Bring the heat to medium low, and add in the polenta. Whisk so it doesn’t clump. Add salt and cook for 5 minutes; stirring occasionally (switch to a spoon for stirring). Mix in the three cheeses and butter. Cook for 3 minutes stirring often. Then, fold in the spinach and cook until wilted, about 3 minutes longer. Remove from the heat and serve immediately.